Most parents have a common desire for their children to be happy and healthy. We may dream of our children’s later successes as they mature, but the bottom line remains that health and happiness are essential for quality of life. It’s a basic human desire, but unfortunately many of the choices parents make on a regular basis work against these goals. Green parenting practices offer solutions that make the whole family healthier and happier. 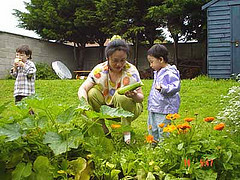 Green parenting combines aspects of an eco-friendly lifestyle with natural parenting methods. From breastfeeding and attachment parenting to organic food and outdoor time, there’s a wide range of experiences that fall under the idea of green parenting. It’s about raising your children with a conscience towards the values of conservation and our environment. It takes a different form in each family, but the effort is there to live more eco-friendly and naturally while supporting your children with practices like those of attachment parenting. Happiness and health are closely related. When one is sick, especially with a chronic illness, it is difficult to feel joy and contentment. By choosing a healthier lifestyle, your family will be happier in wellness. Avoiding toxic food and products, as well as spending time outside, are simple steps to take that lead to health and happiness. Many new parents face the reality of humanity’s future when they hold their newborn baby in their arms. They imagine what kind of world their child will experience as an adult, as well as what life will be like for their future grandchildren. New parents reflect upon how much the world has changed in their own lifetimes. As a result, many new parents gravitate towards making changes to live more natural, green lives. It’s a wise choice that will lead towards health and happiness. Perhaps one day parenting books will describe green parenting as a style, like they do authoritarian, authoritative, and permissive. great article! Good way to summarize what it means to raise green children.